With all the images in the news of flooding due to Hurricane Florence, you may be wondering what to do if you have a similar emergency. Natural disasters like storms aren’t the only things that can cause your home to flood. You could experience a burst pipe or other water system malfunction that causes water to pool. It’s important to know what to do in these scenarios and to be prepared before they happen. Here’s an outline of what steps you should take when your house floods. If a leaking appliance causes your flooding, then cut off water to that appliance. If you can’t determine the source of the water, then shut off water to the whole house. No matter what type of flooding you’re experiencing, whether it’s coming from inside or outside your house, cut off electrical power. This is true even if the power isn’t working. Floodwaters can carry an electrical current, which could shock anyone that comes in contact with it. You don’t want to risk the power coming back on unexpectedly when someone is standing in ankle-deep water. Keep your insurance documents in an area that is easy to access. Once your home has flooded, you want to be able to reach them quickly. Depending on the cause of your flooding, the costs to repair damage may be covered by your homeowners policy or a separate flood insurance policy. Remove these documents and keep them somewhere safe away from the flooding. Before you begin any repairs, thoroughly document the damage. Take photos and video of all your damaged property. Write down detailed information about the condition of your property, and update as needed. If you begin to make repairs before you document the damage, you risk decreasing the amount of your coverage. 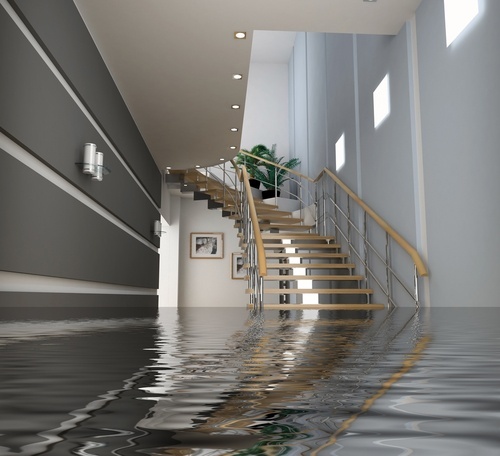 You should notify your insurance agent about your water damage as quickly as possible. This is one reason why it’s so important to keep your insurance paperwork handy in case of emergency. If you are having trouble contacting your agent, then call the insurance company’s headquarters. Let your agent know the extent of the damage and what you need to address immediately. Follow all the directions laid out by your agent. They may or may not want you to wait on those repairs until a claims adjuster can inspect your property. Try to be patient as the claims process can take days or weeks, depending on the extent of the damage to your area. Once your agent has cleared you, you can begin the repair process. Once it’s safe to re-enter your home, start removing water. Use a sump pump or hire a professional. Keep receipts for all your expenses to include with your claim. If you’re in an area that has been declared a disaster, you may need to wait longer for repairs. Be on the lookout for contractor scams that demand money upfront for repairs and always ask for identification from anyone who comes to your home saying they are from the insurance company.